Hi Friends! 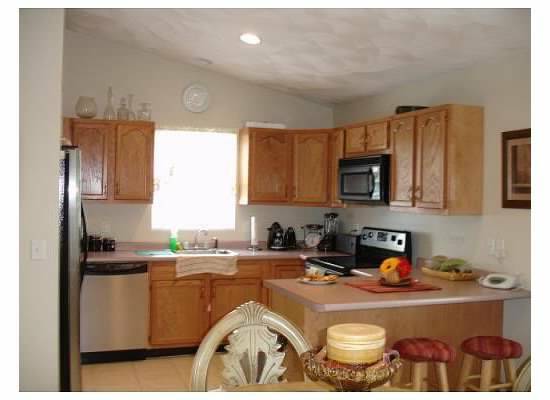 I'm taking a tiny break from posting updates on My DIY Kitchen series and thought I would take a moment to reflect on how our kitchen has changed over the past 10 years. Now we're going to step back in time, way before I had the slightest clue how to use a camera (I'm still learning), and there was no such thing as blogging--so please excuse the not-so-pretty pictures. 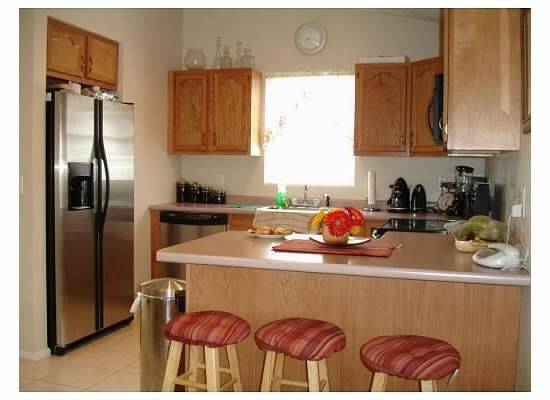 We bought our house in 2005, and we fell in love with the breakfast bar, the high ceilings and the stainless steel appliances. 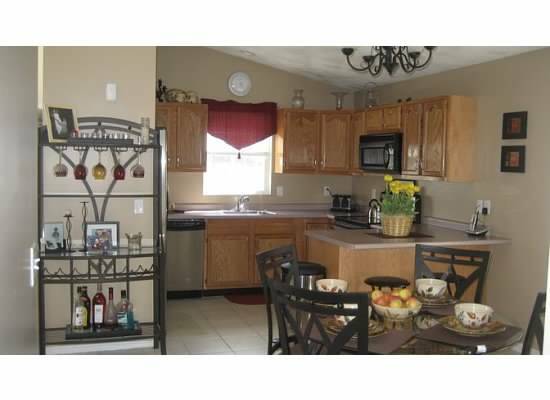 The open concept was wonderful with having two small children, then, ages 2 and 5 . It allowed me to cook dinner and watch them in the living room as they played. 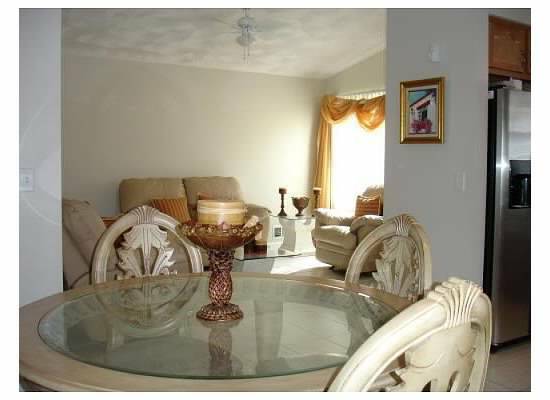 Pictures from real estate listing. 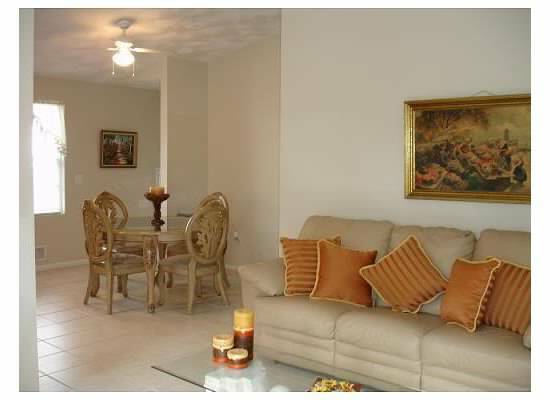 I actually loved the tile floors too, because I've never been a big fan of carpet. 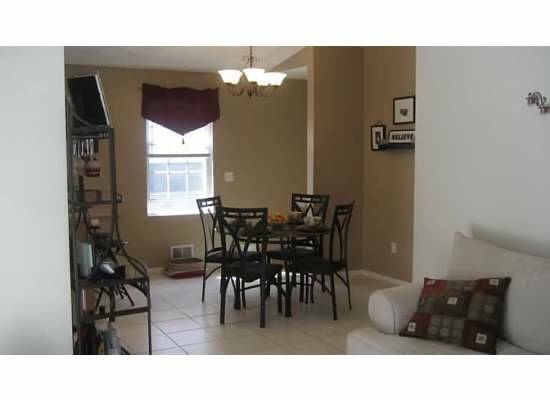 The home was a blank slate and only 2 years old! 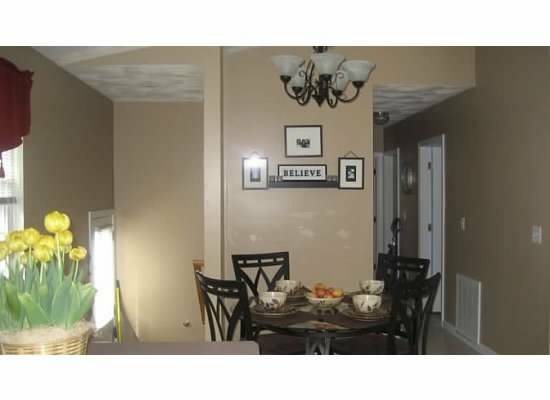 Once we moved in, we quickly painted the kitchen, hallway and basement stairwell in Brown Tepee by Behr. We swapped out the ceiling fan for a wrought iron chandelier. 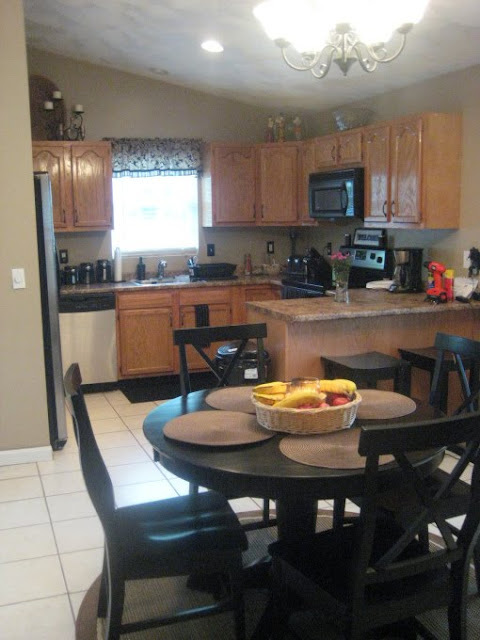 We eventually invested in different counter tops and swapped out the cabinet hardware for oil rubbed bronze pulls, which added a little contrast, compared to the gold ones that were there originally. We got a new dining table and chairs, because having a glass top dining table didn't work out well with little ones. At some point, after we had our third child, I discovered blogging. We started selling our things in favor of antiques and thrift store finds. We enjoyed doing this (and still do) because we can easily get a new look without a huge investment. I added a bead board wallpaper back splash and covered the island/peninsula in bead board as well. I used Traffic Master ceramica groutable tiles and installed them right over the existing white tiles. 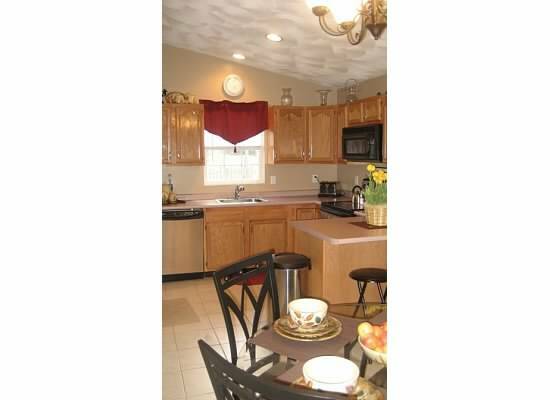 Here is the hideous yellow kitchen with yet another dining table. I really loved this Pier 1 table, but it was really too big for our space. Our home stayed like this for about 6 months and then we suffered from a flood. Our main level and our basement was damaged very badly. These tiles had to be ripped up and we made the decision to use Traffic Master laminate flooring throughout the main floor when we did the renovation. I am a huge fan of TrafficMaster flooring! During the renovation, we decided to lose the breakfast bar, and instead added a pantry cabinet to provide us with much more storage and open space in the kitchen. 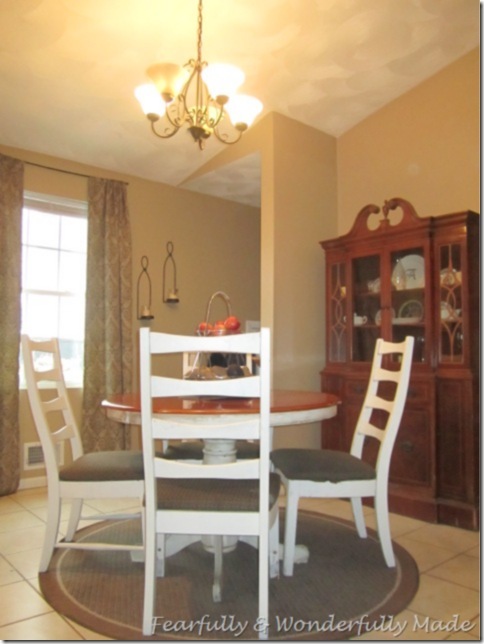 We also changed the paint color--Hooray!!!! 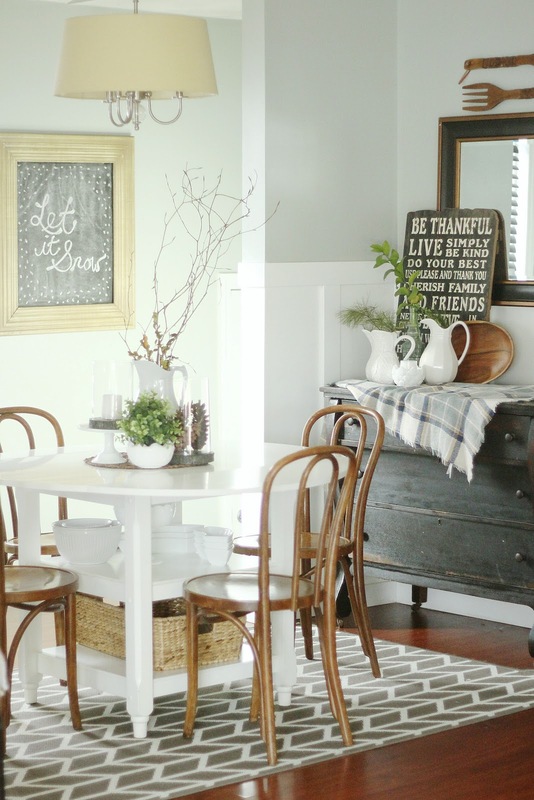 I began to fall in love with the rustic farmhouse look and invested in this dining table from Wayfair. 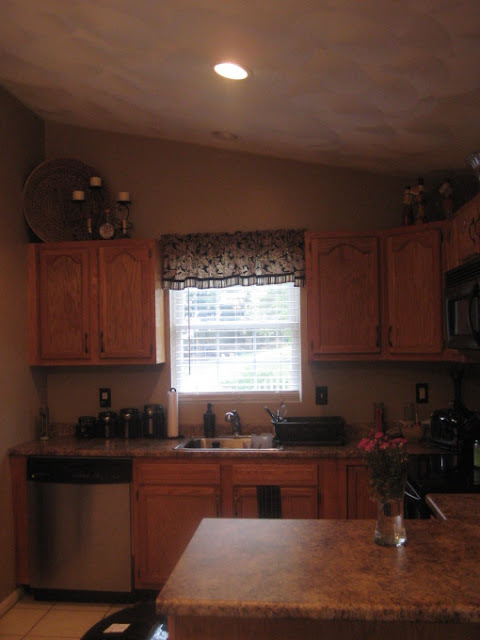 Last summer we made the decision to take down a portion of our kitchen cabinets and installed some easy open shelving. I recently re-painted the blue island my new favorite color: Private Black by Behr. 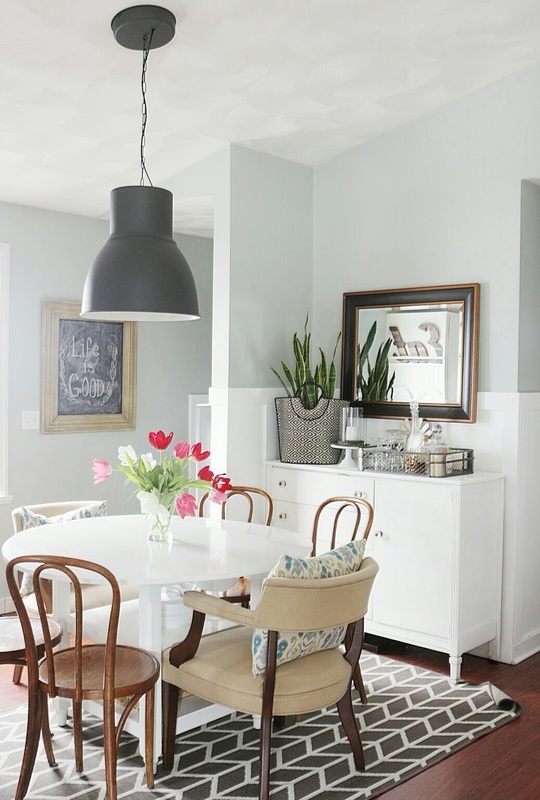 I also changed out the dining area light, and swapped out the old antique dresser for a white sideboard to get a light and airy feel to the space. 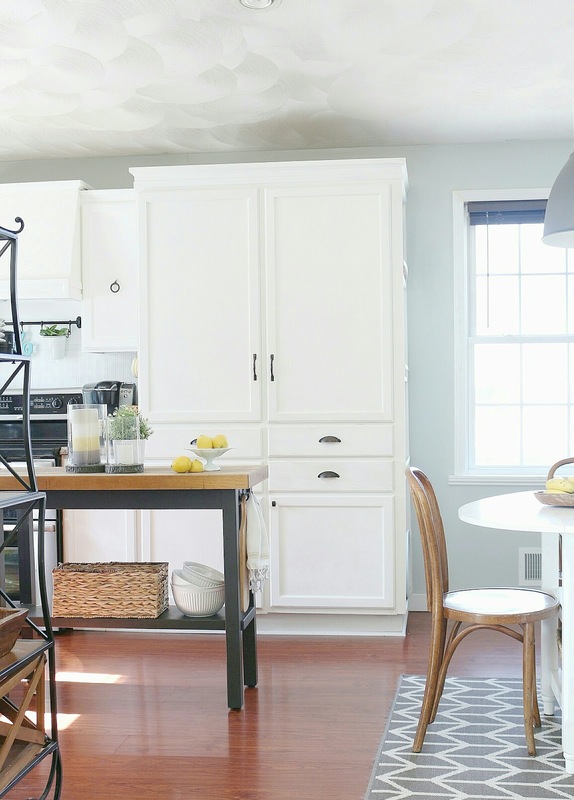 Other recent changes include our plate rack wall, and a DIY rangehood, tutorial coming soon! Though we've gone through numerous changes, not being afraid to take risks, is how we are able to find what truly makes us happy, even if for a short while. While it's far from perfect, it's certainly come a long way! Future plans for this space include new counter tops and possibly a sky light and new flooring, but that'll be in the very distant future, I'm sure. 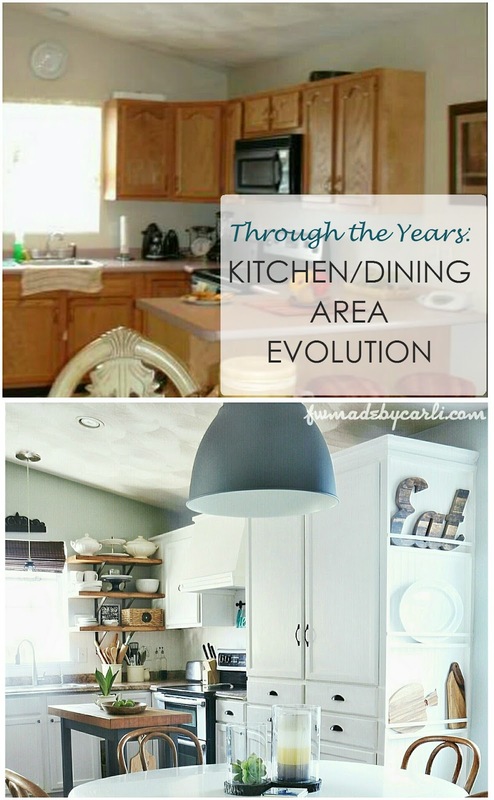 I just love how your kitchen has evolved Carli! 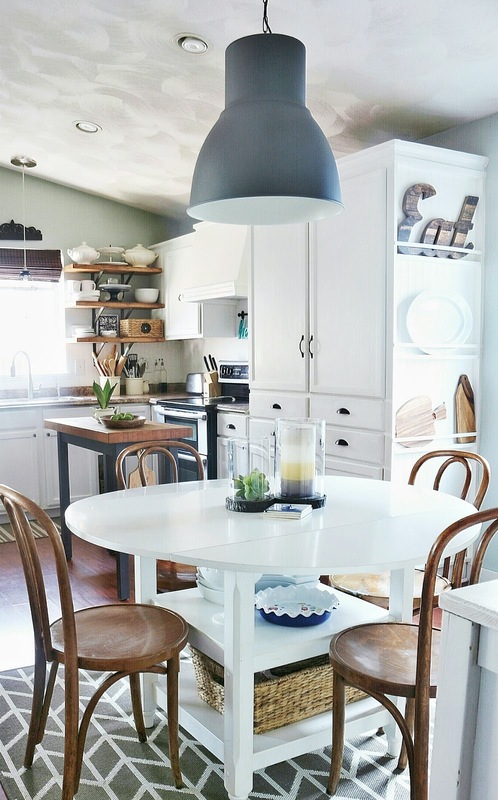 Each new thing you implement looks gorgeous and definitely adds great style to the kitchen. And you wow me with your DIY's. cant wait to see the tutorial for the range hood. It looks awesome! wow! What a journey! 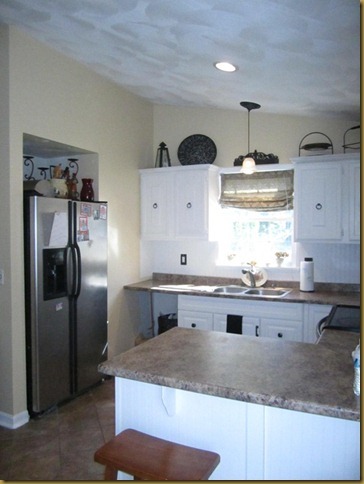 I loved looking through the evolution of your kitchen and I'm happy you have all the pictures. It's great going back to see where you came from. Great job on it all! Thank You Alaya! Yes it has definitely been a journey, thanks so much for stopping by! So pretty! 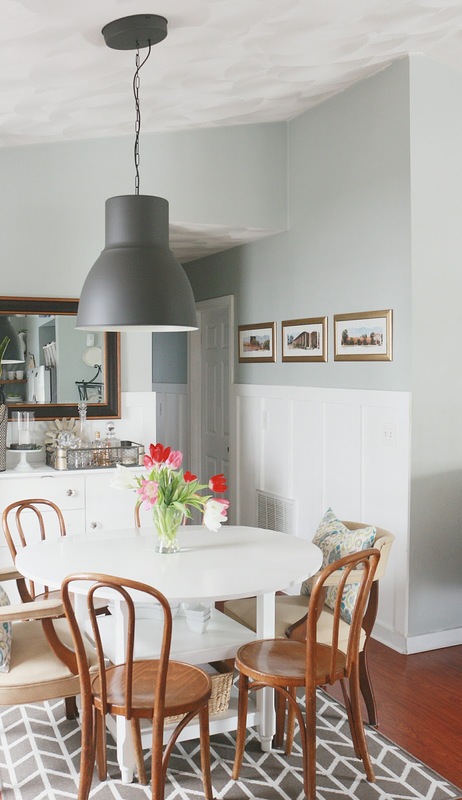 what is your paint color on your walls? The greenish blue one? I love it!